analysis for the ultimate ROI. Get evidence you need to support negotiation with advanced forensic cost analysis & benchmarking. Discover opportunities to reduce costs through innovate design & manufacturing solutions. Identify your optimal sourcing targets and get detailed cost comparisons. Reduce your environmental impact with an advanced carbon footprint analysis. We’ve supported complete product lifecycles for global leaders across dozens of industries. 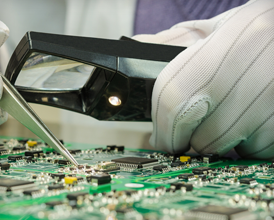 When it comes to electronics, the smallest competitive edge can make the biggest difference to your bottom line. Our team has the technical background and reputation for precision required to provide the accurate data you need. There's no guesstimating here.